Knowledge and understanding of these different realms is invaluable when we wish to deepen our exploration of personal, political, educational and social issues, or when we seek to illuminate profound ecological and spiritual questions. Understanding the realms also plays a part in the development of creativity. Becoming familiar with this new aspect of constellation work will undoubtedly widen the range and application of this work for all practitioners. The Five Realms is a model developed by Judith Hemming (inspired by original concepts provided by Jim Kepner) that enables people to explore questions, issues and ideas from a number of perspectives provided by different energetic sources. A clear understanding of the different realms and how they affect our work, including the impact of the wider realms on somatic, personal and systemic experience. 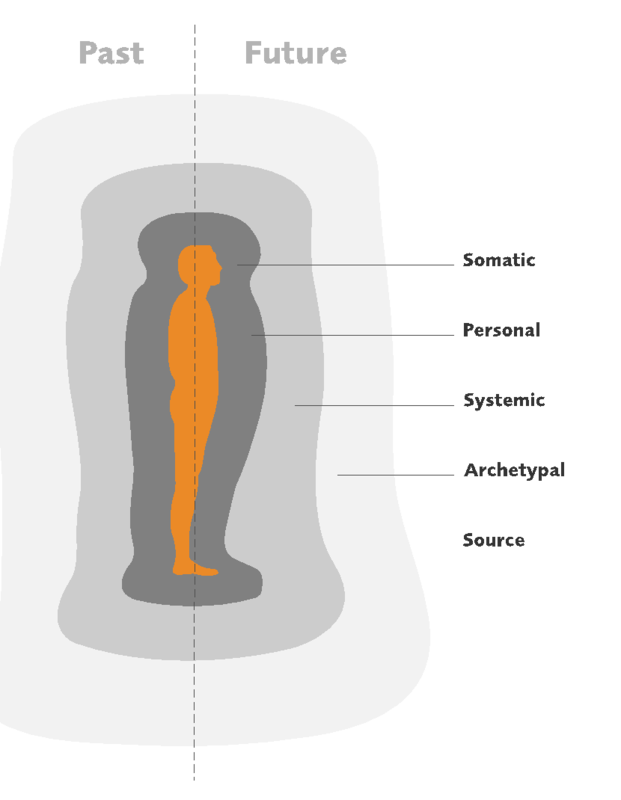 A deepening sensitivity to the knowing field, which connects the subtle chemistries of the body to information from the wider field or source. An ability to recognise or ‘sense’ the different realms – each realm can be experienced physically as a vibration with a different frequency. A sensitivity to the realm which may be most hospitable or helpful – of course, until we know the difference, we all have a tendency to fit issues into the realms whose vibrations we unconsciously know the best. An understanding of how to use the realms to assist and support a question. A way of clarifying direction and intent in the invisible realms that are us and surround us. An understanding of the archetypal and divine, looking at the power of intension, prayer and rhythm (such as drumming) within constellation work. Greater diagnostic accuracy giving an understanding of where to begin with any client or question. This course is not a training in constellation work. A basic knowledge of constellation work will be assumed – at the very least participants need to have attended some workshops. Therapists, coaches, consultants, educationalists and social activists are most welcome. Dates Friday 22nd June 2018. Arrival by 6pm, course finishes 3pm Wednesday 27th June. Price £1,482. To secure your place we will need a non-refundable deposit of £550. Please Note: This course is residential, and the price includes all meals and accommodation for the duration of the training. The course fee does not include drinks purchased at the bar. The accommodation covers 5 nights and assumes departure on Wednesday 27.6.18. If you would like to book an additional night the cost is £50.00 for bed and breakfast paid to the hotel directly on departure – to book please contact courses@thecsc.net. Here is a brief explanation of each of the realms to give an idea of the territory you will be working with. This is the realm of the body, and although we may not know all that our body is trying to deal with, the information about this aspect of our health is core. Some sensations are immediate, transitory and somatic – e.g. they give off faint but powerful messages. For example a person in love gets a special kind of attention even as they walk down the street because of the changes in their smell. We receive information through changes in breathing, and of course we see the long term consequences of allergies, or a depressed immune system, or dealing with trauma or serious illness such as cancer. These issues need to be dealt with directly or they may undermine a person’s more conscious plans. This realm is often attended to by doctors, (including those with ancient forms of knowledge), and by diet and other kinds of bodily support. The personal realm carries information about our personal history, especially to do with what we have done or failed to do, received or avoided – and the costs and consequences that have arisen as a result. This realm often acts as a kind of barrier to being sensitive to other realms as we may have desensitised ourselves and therefore can’t register anything more subtle. It registers unfinished business, especially people we have hurt or cut ourselves off from. It remembers such things as abortion and unexpressed grief, as well as our moments of courage. It knows about longings. It can burn brightly when we connect to the richness of what we have achieved and worked for. This realm is most commonly attended to in our society by traditional psychotherapy. The systemic realm is what constellations have especially opened up. This realm takes us into the much wider territory in which we are situated, and is experienced more directly as coherence and alignment – or the lack of it. It opens up the great importance of context. It is less personal, less fixed, yet obeying powerful universal laws and is therefore hugely influential. We are blessed to be able to register this realm and work with it. We discover hidden motivations, the impact of missing elements, the demands of balance, and the powerful impact of events and people from the past. Many hitherto stubborn problems become clear in this realm and solutions appear. The archetypal realm is less personal still. It deals with eternal themes that are part of being human – birth and death, war and peace, passion, envy, loss, hope and despair, choice and constraint. Religions often characterise it in terms of creativity and destruction. This realm takes us a long way past therapy or medicine or management consultancy and into spirituality, mythology, philosophy, and our attitudes to fate and freedom. It’s full of surprising gifts, especially for those who find the same problem restlessly re-visited. It costs us our high hopes of constructivism – our sometimes grandiose views that anything is possible if only we have strong intention. This is the realm where the field connects us to themes that are eternal and much bigger than we are. Beyond the archetypal realm lies source energy, the field or the divine realm. This is the source of everything, and what comes from it arrives by grace – if we are able to discern the way it travels so as to be an ‘instrument of reception’. This realm sources all the others, but is not given much attention in this century and our materialistic, western world. Sometimes only this realm can help. To Book: To secure a place we will need a non-refundable deposit of £550. Please click the green ‘booking’ button at the top of the page and follow the instruction to make this payment. Other: If you are not known to CSC, then a short telephone interview may be arranged once we have received your deposit. Cancellation Policies: Please note that the deposit is non-refundable, whatever the reason for cancellation. For cancellations made between 2-4 weeks before the course starts, 50% of the course fee will be charged. Cancellations made less than 2 weeks before the course starts, no refund will be given, whatever the reason for cancellation. Acceptance on the course: In order to be accepted on this training you must have a basic knowledge of constellation work – the minimum we require is that you have attended one workshop or training in Systemic Constellations in the last 3 years. If you are not known to CSC, then a short telephone interview may be arranged once we have received your deposit. To book a place: We need a deposit of £550 to secure your place on this course. Please note that the deposit payment is non-refundable. The remainder is due one month before the training starts. The deposit is non-refundable, whatever the reason for cancellation. Cancellations made up to one month before the start of the event will forfeit the non-refundable deposit but all other payments will be refunded. Cancellations made less than one month before the start of the event, the full fee will be retained by CSC, whatever the reason for cancellation.